For the first time in Iran’s futsal history, two Iranian women futsal judges are appointed to judge the European Women’s Futsal Cup, chairman of the Football Federation Refereeing Department, Davood Rafati, announced here on Monday. Gelareh Nazemi and Zari Fathi are gaining to judge the European Women’s Futsal Cup to be hosted by Portugal, February 15-17, 2019, IRNA reported. 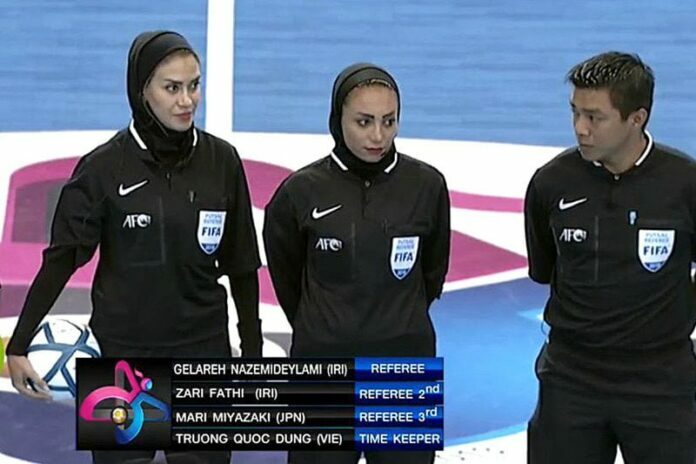 Nazemi, who has started futsal refereeing since the Iranian year 1380 (beginning March 21, 2001), has been selected twice as the best referee for women’s futsal in Iran. Nazemi has been the referee for the World Student Futsal Final Games in Germany and she has refereed women’s futsal games between Japan and Portugal at the 2018 Youth Olympic Games in Argentina. Fathi, the other appointed referee, has officiated the Asian Women’s Futsal Championship and the World’s Students Futsal Games. “I am very happy that a new event has happened for Iran’s women’s futsal refereeing,” Fathi said expressing hope to be a competent representative for the Iranian women’s futsal refereeing community.